Most old fashioned fruit Punch recipes did not call for alcohol, as beverages served at pharmacy soda fountains needed to be non alcoholic. After all, these were the days of temperance and prohibition. The place of the liquor was cleverly taken by a delicious combination of crushed and sliced fruits, fruit juices, fountain syrups, soda water, and often the grated rinds of oranges and lemons. This makes them perfect moctails! These old time fruit punch recipes are fun to try. Fancy punches are perfect for serving on special occasions such as a wedding, an anniversary, or a teen birthday party. Enjoy them anytime as a "moctail" or refreshing soft drink. Note the suggested beverage prices for 1915 soda fountain customers. 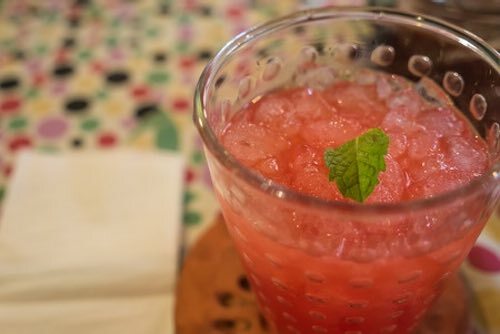 Into a tall glass put some shaved ice, add 2 ounces of cherry syrup, a little lime juice, a spoonful of crushed pineapple, and shake; then fill up the glass with carbonated water and top with a slice of orange and slices of strawberries. Serve with straws. Price—10 ounces, 10 cents. 1/2 ounce cherry syrup, 1/2 ounce lemon syrup, 1 ounce sarsaparilla syrup. Pour syrups in large glass, add cracked ice. Fill with carbonated water, using fine stream. Finish with a cherry and a cube of pineapple. The punch is a good special and should be priced at 10 cents for 10 ounces. Make a syrup of equal parts of strawberry, pineapple, and orange syrup. Use 1-1/2 ounces of this syrup to a glass one-third full of ice. Fill with carbonated water, coarse stream, and add a few strawberries, a slice of pineapple, a slice of orange, and serve with straws. The juice of half a lemon will bring out the fruit flavor in the punch. Price—12 ounces, 10 or 15 cents. Into a glass partly filled with shaved ice pour three-fourths ounce of pineapple syrup, 1 teaspoonful of lemon juice, and a teaspoonful of raspberry vinegar. Place a mixing spoon in the glass and almost fill the glass with carbonated water, coarse stream. Add a little more shaved ice, on the top of which placed crushed strawberries. Between the glass and the ice insert a slice of orange. Serve with spoon and straws. Price—10 cents for 10 ounces. 2 ounces pineapple syrup, 1 ounce orange syrup, sufficient shaved ice. Serve solid in 12-ounce glass garnished with slice of fresh fruit. Charge 10 cents. 3/4 ounce raspberry syrup, 3/4 ounce orange syrup, juice of 1 lime, 1 ounce grape juice. Pour the syrup into a 12-ounce glass, then add the lime juice and grape juice. Fill the glass one-third full of shaved ice and complete the filling with carbonated water. Mix and decorate with two cherries and two pineapple cubes on toothpicks. Price—10 ounces, 10 cents. 1/2 ounce strawberry syrup, 1/2 ounce orange syrup, 1/2 ounce pineapple syrup, 2 dashes lemon juice, 1/3 glassful shaved ice. Place ice in glass, pour on the syrups and fill with carbonated water. Trim with slice of pineapple and two strawberries. Serve with straws. Charge 10 cents for 10 ounces. Most punches sold in soda parlors were individually mixed for the customer and to make the drink extra special, a garnishment of sliced fruit or candied cherries was often added, and sometimes a sprig of mint. Effort was made to make the drinks very colorful and appealing. Fountain operators sometimes mixed their punches in quantity and attractively displayed them on the marble counter in a large cut-glass bowl containing cubes of ice and decorative pieces of fruit. Customers received their beverage in special punch glasses with a small cube of ice and thinly cut fruit slices placed in each glass. This is a great idea for serving fancy punches at parties. The vintage recipes for fruit punch are very easy to make and fun to try, so learning how to make fruit punch from scratch takes only minutes. Fancy punches are perfect for serving at parties and are similar to today's "moctails." If you need an easy non alcoholic beverage recipe, you can't beat these.